Revered horror culture figure Del Howison talks about his latest venture. News hit the weird web today that our pals at horror culture establishment Dark Delicacies in Burbank, California have joined forces with production company and studio Vega Baby to form a new home entertainment label focused on the horror genre. 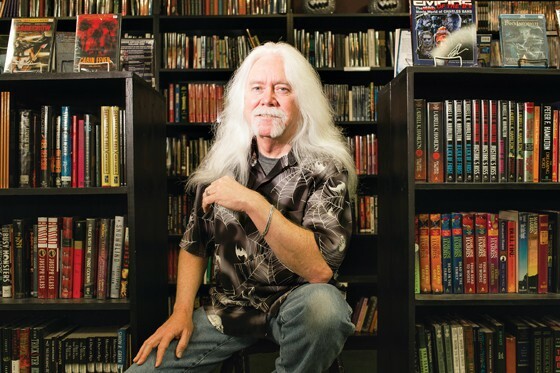 Under the new deal, Vega Baby and Dark Delicacies (which is run by author Del Howison and his wife/partner Susan Duncan-Howison) will identify and acquire horror films to be marketed and distributed under the newly formed banner “Dark Delicacies Presents” in the US and Canada. Fans and friends of the Howisons know just how dedicated they are to exploring and supporting the genre and its many appendages and it’s incredibly exciting to know that their more evolved sensibilities will be helping nurture a new wave of horror and dark fantasy filmmaking. How long has this been in the works? Why strike now? horror filmmakers looking for a way to get their works out in the marketplace. Dark Delicacies had held a couple of signings with Vega Baby such as the Dave Navarro documentary MOURNING SON or the Joe Lynch/Salma Hayek project EVERLY. We loved working with them and our personalities seemed to be compatible. So their idea was to look at all of these films people send us and chose a select few to get release. Between us we created the blend company Dark Delicacies Presents. brand, what kind of films will you specifically be looking for? field. Some might get limited release along with the simultaneous VOD prior to DVD release and some may go direct to DVD. Both companies are tired of talented filmmakers getting screwed by having no outlet for their films but a cheap buyout where they really have no chance of making their money back or getting decent exposure. That doesnt mean everything we release will be profitable or a hit. But we are damn well going to try. The manifesto is a certain level of quality. Were hoping that when the consumer sees the Dark Delicacies Presents stamp of approval on the film they realize they can, at the very least, get a certain level of quality and entertainment value. We want the next IT FOLLOWS, THE BABADOOK and DARLING, that kind of quality film. We would love to cover all aspects of horror. Dark Delicacies has been the standard bearer for Horror fans around the world for over two decades. Known as The Home of Horror the retail store in Burbank, California has hosted signings every week featuring actors, artists, authors, composers, directors and more making them the go-to place for horror enthusiasts. Dark Delicacies is a recipient of the Il Posto Nero Award from Italy for excellence and has had three anthologies published for which editor and co-owner Del Howison won the Bram Stoker Award for excellence. He has also been nominated for the Shirley Jackson Award and the Black Quill. Vega Baby most recently entered into a multi-year distribution agreement with Sony Pictures Home Entertainment and is in production on the horror/thriller DEVILS WHISPER written by Paul Todisco and Oliver Robins who recently wrote ORDER OF THE SWANS for Bryan Singer and Bad Hat Harry Productions. Vega Baby’s slate also includes an untitled Chris McQuarrie script; KIN (f/k/a DIG) an action/thriller Black List script written by Adam Taylor Barker; and CURSE OF POLTERGEIST, a documentary starring Oliver Robins who starred in the original POLTERGEIST.